If you have have a high resolution monitor and RDP (mstsc.exe) is much to small to read, here is a small tool to fix it. You can enable, or disable the fix if it causes any issues. Hey Nemesis, great tool, is there a way to run this fix silently with the tool? Whats New? It's Prettier! / Displays fix status on run / Auto-elevates to Admin (Required to write the manifest file out). 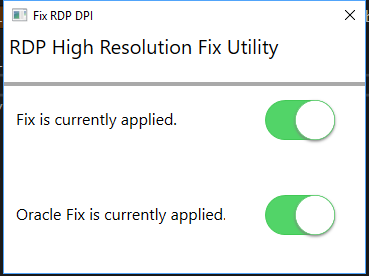 What is it: If your on a high resolution screen and RDP is way to small to see - this fixes it. Hmm, new install keeps crashing when I try to run it. This is to be installed on the workstation with the DPI issue as generally high res monitors are not found on servers. I've reverted to the old code temp while I review the issue. Ahh, my mistake. Thanks for the reply. Will let you know how this goes. Ok, Server OS incompatibility handled gracefully now. Thank you for the reports!